A series of drug cases revealed by Chinese authorities last week have highlighted an increase in drug trade from Burma into China. On Tuesday, an anti-drug campaign in Fuyang, in the coastal Chinese province of Anhui, led to the seizure of 24 kg of drugs and the arrest of 74 people. Of these, 23 kg of heroin and methamphetamines could be traced to Burma, according to an interview with a detained suspect by the Chinese daily The Mirror. On Wednesday, police in Urumqi, the capital of China’s vast western Xinjiang autonomous region, reported the seizure of 4.8 kg of heroin and the arrest of six drug-smuggling suspects. The heroin had been smuggled in tea boxes from Yunnan, the Chinese province bordering Burma. The following day, the Kunming Railway Police Department revealed that it had busted a drug-smuggling ring, arresting 26 and seizing 62 kg of crystal methamphetamine and three Burmese firearms, in an operation last year. The drugs originated at the Sino-Burmese border and were destined for Chongqing, a metropolis in western China with 32 million inhabitants, and Wuhan, the capital of central China's Hubei Province, according to information released by Kunming authorities. Two smugglers caught in the beginning of last year, one Chinese and one Burmese, provided information on a smuggler group led by a Hubei native called Liu Gang. Liu Gang and six associates were arrested in Jinghong, in Yunnan’s southernmost prefecture Xishuangbanna, in May last year, when they were smuggling 17.8 kg of crystal methamphetamine from Burma. Confessions revealed that the drugs were destined for Wuhan and Chongqing. The smugglers traveled twice a month between Jinghong and Wuhan, each time transporting around 400,000 pills for a local crime kingpin surnamed Nie, according to the police report. In a raid last August, Nie was arrested with 8 kg of methamphetamines and three Burmese guns. Nie later told police that he had bought the guns for 30,000 yuan (US $4,700) each in Burma. Likely convictions will lead to death sentences for most of those caught smuggling those large amounts of narcotics. Article 347 of the Chinese criminal law allows for the death penalty for trafficking or selling more than 50 grams of narcotic drugs. The Chinese authorities do not make public how many people are executed each year for drug-related crimes. Last Wednesday, the Yunnan provincial government said it had confiscated 13.5 tons tones of narcotics last year. Three police staff were killed in dealing with drug-related crime. Both the number of arrests and the amounts of drugs confiscated marked all-time records, the deputy head of the provincial security department Yan Shangzhi said at a press conference. According to a Xinhua report, the province’s anti-drug trafficking campaign last year led to the arrest of 17,000 suspected drug dealers. Yan’s comments came a day after police arrested two methamphetamine smugglers in Yunnan’s Shuangjiang Prefecture. The two young men from Puer were caught with 110 grams of methamphetamines at a roadblock. Armed roadblocks for drug checks are a common sight along the main roads at the Sino-Burmese border. One taxi driver in the border town Ruili told The Irrawaddy that he frequently drove traffickers. He said they were easily recognized, because they always wanted to get off before getting to the usual roadblock positions and then made their way through the hills by foot. 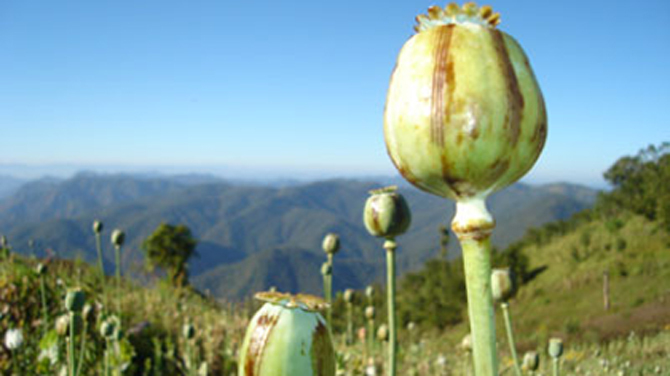 Burma was the world’s second-largest producer of opium after Afghanistan in 2011, according to figures released by the United Nations Office on Drugs and Crime (UNODC). Opium poppy cultivation has doubled since 2006, but is still only at a third of the level of 1998. Burma accounted for 12 percent of the world’s opium production, up from 5 percent in 2010. Despite the continuous increase in opium cultivation, UNODC expressed cautious optimism in a press release on Friday on the completion of fieldwork for its 2012 annual report. The international agency stressed the importance of an end of fighting in Shan State at the perilous Sino-Burmese border to the fight against narcotics cultivation and trafficking. “Ceasefires present the opportunity for a new beginning,” UNODC Myanmar Country Manager Jason Eligh said. To eliminate the drugs activitis required PEACE in the area where poppy is growned. Have to replace other crops to cultivate in the area is essential. Tun Myint Naing owner of Asia World Company in Burma was established drug business in Koo-kang area, northern Shan Sate at the time of Ne Win era in Burma was the worse period, because Law Sit han is friend of Ne Win.Now is the time to rid off poppy incorordination with PEACE plan with KIO. Inact laws like in Singapore and Malaysia; excute all drug dealers. Take no prisoners, have no mercy for the scums of society.